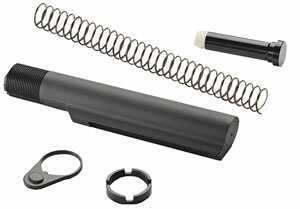 The Bushmaster Lower Receiver Parts kit includes all necessary internal parts to completely build an AR lower receiver. Included internal parts are trigger, hammer, disconnector, safety selector lever, bolt catch, magazine catch, magazine button, front and rear pivot pins, and all necessary pins, dentents, and springs. 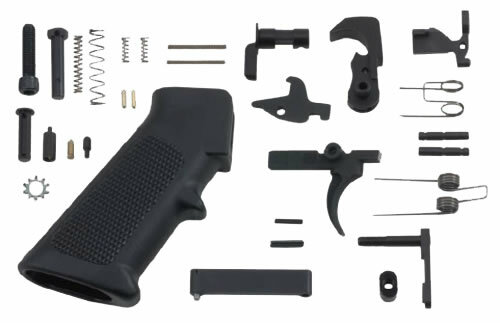 A standard A2-style pistol grip constructed of high-impact polymer featuring a ledge for the second finger, molded in checkering, and deep grooves on the backstrap for improved control under recoil is included in the kit. 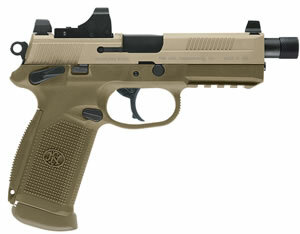 A molded high-density polymer trigger guard is also included.